Ptosis appoints the eyelids that hang down that are caused when the muscle to open eyes are weaken by congenital reasons, an external wound or an aftereffect of a wrong surgery. Ptosis makes eyes looked sleepy, and wrinkles can be made by raising foreheads to have visual field. In a case both eyes are ptosis, it is difficult to correct as symmetry than the case only one is ptosis. After correcting severe ptosis, eyes does not be closed immediately after surgery, it can result in sleeping with opened eyes, but it is improved as times pass. When one does not want to make a double eyelid, it is possible to correct only ptosis, but very small hidden double eyelid will be made. Examples) A figure when one has ptosis, that is, it is painful to open eyes by raising eyebrow and it is difficult to has a visual field. Attractive eyes must look fully opened, and not half-way closed. When the eyes open fully, the pupil must be exposed so that the eyes create a clear expression. It is important that the eyes open up without using the muscles of your forehead. Because Korean people are related to the Mongolian race, their eyes tend to look closed and incomplete. Because of this, the surgeon must be able to fully consider the refinement of the eyes for a brighter look. The eyelid surgery and the epicanthoplasty greatly benefit the eyes in an aesthetic point of view, but also in a medical and an anatomical perspective. 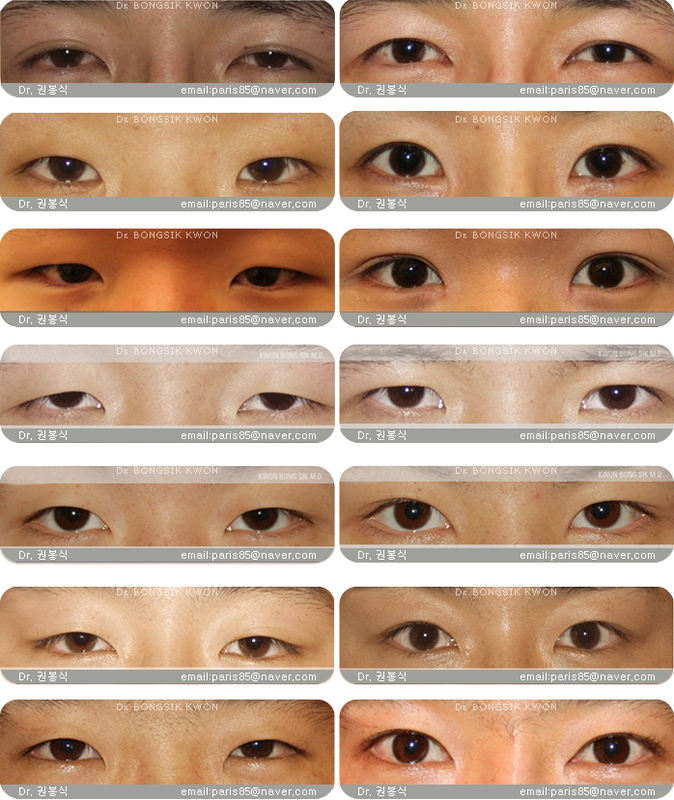 Patients who underwent the ptosis correction surgery. Cases of patients who had asymmetric ptosis. cases of revisional double eyelid surgery with ptosis correction. The eye can look very different depending on how much of the pupil is covered by the eyelid. This is determined primarily by the function of levator muscle in the upper eyelid, and is important in the beauty of the eye. In a normal opened eye, only 1-2mm of the pupil is covered by the eyelid. When the eyelid hangs lower, it makes the eyes look sleepy and unclear. If a typical double eyelid surgery is performed on this case of true ptosis, the double eyelid will look far from ideal. This is because the double eyelid is made by drawing down the levator muscle, the muscle that controls the eyelid, and because the levator muscle in true ptosis loses functionality, the eyelid cannot be folded properly. 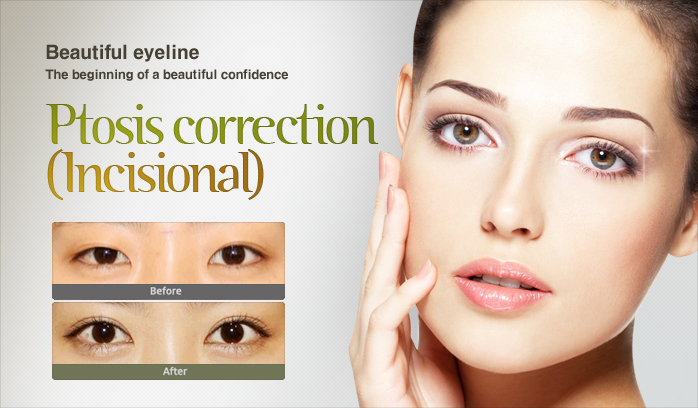 In order to correct this, the double eyelid surgery has to be accompanied by another that treats the ptosis. Only after correcting the ptosis and restoring proper functionality in the ptosis is it possible to sculpt a clear double eyelid. 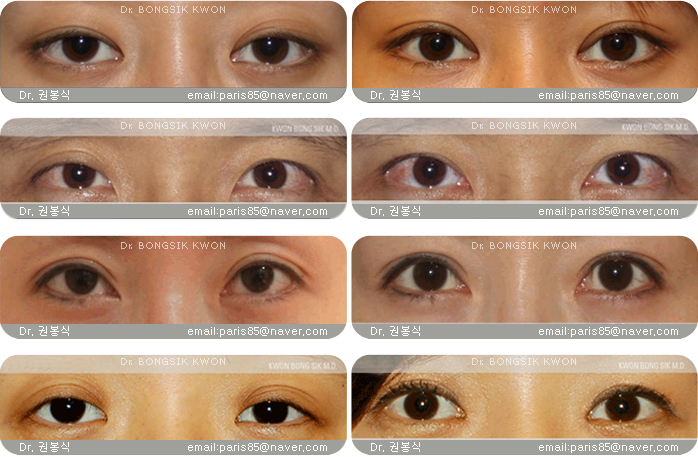 Although less severe ptosis is common among Korean women, true severe ptosis is not. In true ptosis, the levator muscle of the upper eyelid causes a functional problem by allowing the eyelashes to cover the iris. In comparison, in pseudoptosis, the eyeline sits 1-2mm under the pupil as usual, but additional skin from the eyelid hangs down and covers more of the iris. Thus, peseudoptosis does not cause functional problems in opening the eye, but it looks much like true ptosis. Pseudoptosis is usually accompanied by severe Mongolian folds and is often misunderstood as true ptosis. 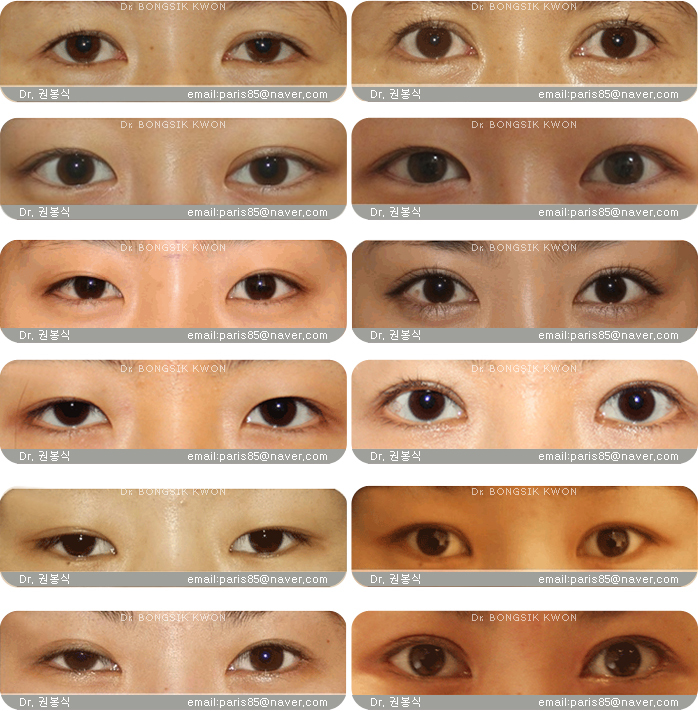 In this case, clear and distinctive eyes can be made by better visibility of the iris through Magic epicanthoplasty and the incision of a double eyelid. Pseudoptosis has to be correctly distinguished from true ptosis and if there is any doubt, it is recommended that an accurate diagnosis by an eye plastic surgery specialist takes place. This is performed by reducing the length of the levator muscles of upper eyelid, the muscle that opens the eyes, by binding it with threads. There are two ways to do that. The first is doing it by binding without cutting the elevator muscles of the upper eyelid, and the second is excising them. The latter is more effective and is applied more often to severe ptosis. When the function of the eyelid muscle is too weak, an operation has to first be performed in a functional respect followed by the purpose of beauty.